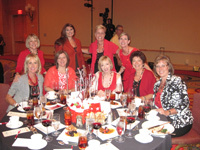 Women for ATSU members include individuals in our community, business partners, University employees and alumni. Annual dues are pooled in a fund that members direct toward scholarships, programs, and healthcare education projects at the University. Membership dues are a minimum of $500 annually with a special ATSU alumni rate of $250 for those who graduated within the past two years. Dues can be paid in full or in increments. The funds are tax deductible to the extent allowed by law; the University is a 501(c)3. Join Now… and help us make a difference!